The Entry Submissions time frame for the “FractalForums.com Spring 2010 Fractal Art Competition” has now ended. This submission period set a new record for Member Activity on the FractalForums, with around 650.000 Page Views!!! We would now like to enter the voting period, which will last until the end of May 2010. We have a total of 130 entries to the three different competition sections. And due to the large amount of entries, please take your time to review each of the submissions and give a reasonable vote for what you consider “best” images per category. Only the Gallery votes count for the results. So, no external embedded video Sites Rating system is taken into account. • Fractal Fun — Contains computer generated fractal art of any kind. This section was the most popular with more than 64 entries. • Fractal Movies — For the first time in the Forums’ history, there was a movies/video section, with a total of 19 entries. It’s been around for a couple of years and that’s the strangest part of it. Fractal forums and other community venues almost always fold up after the intoxication of the opening event wears off. That’s about 3-6 months, I’d say. That’s how it was for Orbit Trap’s campfire singalong days. But FractalForums.com is still singing and the campfire isn’t going out. What is FractalForums.com doing right that Deviant Art, Renderosity, the Ultra Fractal Mailing List and so many other community venues (largely dead and forgotten) have been failing at? Half the postings there on FractalForums.com annoy me and the other half seem unimportant. Is that the magic combination for a vibrant and self-sustaining community site? Something for everyone and a steady stream of provocation? The web-rings are no longer breathing. 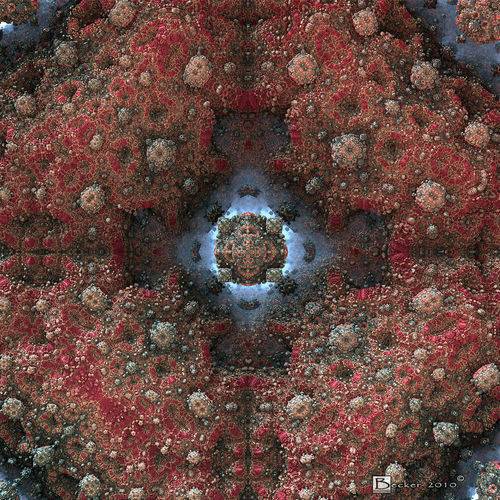 They were a great idea in the 90’s but Google has done a better job of locating fractal art sites for the last 10 years. The community art sites are brain-dead; Flickr’s beginners out-perform Deviant Art’s masters on a regular basis these days. I have no idea why FractlForums.com should be thriving in such a wasteland, but it is. Maybe there’s something about the social environment at FractalForums.com that draws in people from the old stuffy places? –and keeps them coming back. Something nourishing and enticing? What could it be? Even I’ve joined in on some of the threads over there and I almost always avoid opening my mouth in a forum these days. If a place like that can engage someone as jaded as me then there must be something special going on, whatever that invisible quality might be. I’m even reviewing their contest and I find art contests distasteful. Based on all that, I guess I ought to say that the first prize should go to FractalForums.com themselves in the category of Most Relevant Fractal Art Community Site. The email tells me that there’s three categories to the contest and that they’ve been carefully defined. But the first lesson in judging art is to stop listening to the people around you and ignore the boundaries they’ve constructed. Trust no one. I’ve made up my own categories and the first is a general one and I call it the At Last! Something I Wish I’d Made And Could Take Credit For –category. My Secret Garden by SaMMy. Click to view full-size at FractalForums.com. My next category is one which most fractal artists will immediately relate to. I call it the Astonishing Thing That I Cannot Describe –category. The winner is obvious, but only if you view the image full-size. For that reason I’ve only included a link. No thumbnail or fair-use version can do justice to this great golden vision. You have to go there and see it life sized or not at all. Next, a category for which there was really only one serious contender. The Best Rendition of Bocklin’s Isle of the Dead I’ve Seen Recently –category. The author calls it “Mandel-blob” but remember: when judging art stop listening to others even when it’s the artist themself speaking. I think this one’s my favorite. But that’s not a category. Hey! 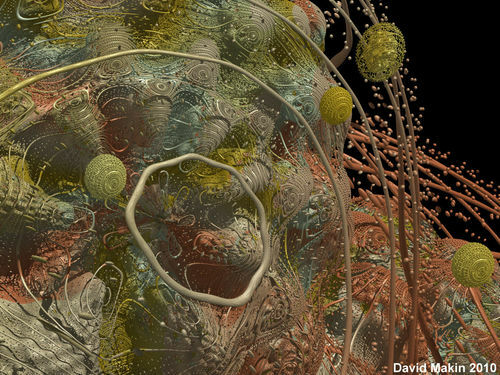 It certainly is the year of the Mandelbulb, isn’t it? 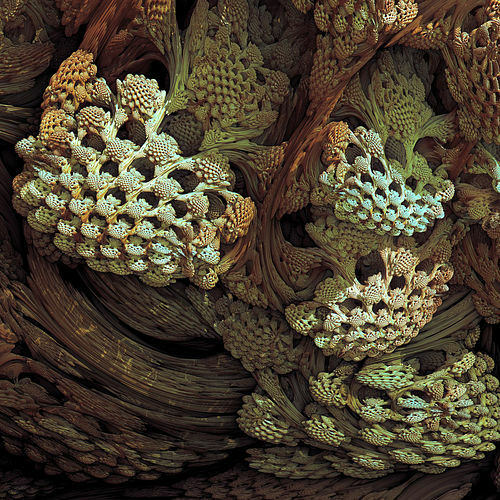 My next category is the Best Rendering of the Mandelbulb Formula, Now Let’s Move On To Something Else –category. This one really is very nice. I’m not being sarcastic; the coloring and shadows and detailing is very well done. Congratulations, Kraftwerk, for making something new out of something that’s become rather stale very quickly. Nice screen name too. That isn’t a category but might be one worth adding next time. 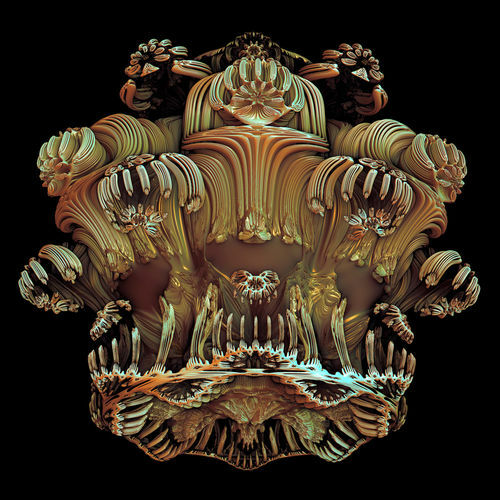 Did I saw let’s move on from the Mandelbulb? 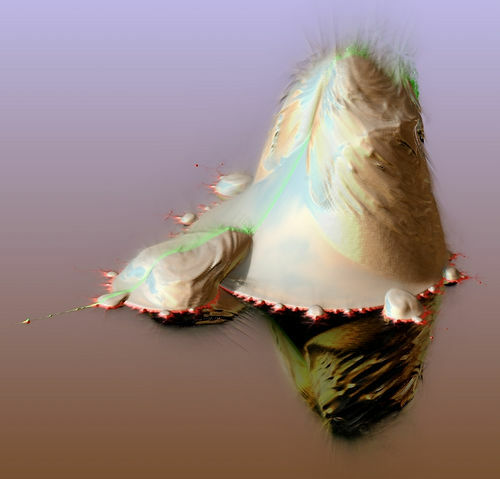 Next category is Second Best Rendering of the Mandelbulb Formula, This Could be a New Genre and the winner is Kraftwerk, again. Maybe it all depends on how you render these formulas and not the formula itself. There’s something majestic about this image. It’s got something impressive and attention grabbing about it. Back in the old days of vinyl records this would have made a great album cover. Next up is the Hey, I Like Those Colors But I Bet No One Else Will –category. I don’t know why palettes like this are so uncommon. There’s a real retro Sci-Fi mood to anything using these sorts of muted colors. Maybe it just doesn’t appeal to the young folks? (I’m 45). The final category, the You’re A Better Man Than Me Gunga Din –category. It’s an animation. Two weeks of rendering? For me, two minutes to render something is too long. 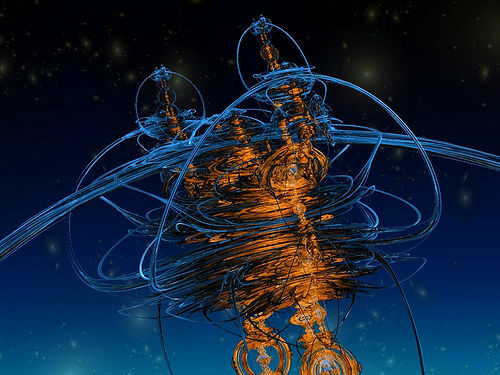 The winner is Buddhi with Flight Through BulbBox a very detailed and extensive 3d fractal tour. Two weeks! He must have more than one computer. Wait, one more category: Not Really Part of the Contest But It Should Have Been. I guess these stills in the animation section were just meant to be placeholders or something, but this one looks great. Dangerous Spaceship by "bib" (not bub!). Click to go to FractalForums.com page for video. I’d say Dangerous Spaceship is one of the top five images. And I’ll bet it’s not even part of the contest, technically speaking. Well, contests are like that. The winners don’t always win. The Competition is meant to be more in the way of “fun” and less on rules, criteria, and other such complications. But like any contest, there will be a few that try to make a bigger deal of it than they should. As to the entries, you have selected several of the more interesting ones for this review. And I got a chuckle from most of the categories you created. I enjoyed reading your review !!! Thanks for watching my video :) And yes, the Dangerous spaceship image is not even in the video. However it’s based on the same fractal. For me, a lot of the attractiveness of Fractal Forums is that there are many substantive conversations in the discussion threads. deviantART and Renderosity feel like “hit and run” sites–post an image (or 12) and quickly move along. Or maybe that’s just how I use them. While there are images at FF, I think most folks are there for the discussions, and it’s a nice change. I think that fractalforums.com:s winning concept is that it allows a wide range of people with different interest of fractals come together and interact. There are the theories of the mathematicians, the rendering technique experts, the mathematical creative and people like me, with a more “artistic” or philosophical interest in fractals who explore the beasts while others move on to look for the new Grail. I hope the spirit of the forum will keep on and that new amazing versions of 3D and other fractals will be born out of this boiling soup of creativity and knowledge. Forgot to mention the programmers on the forum, who kindly share the applications they have invested their time into. Without all this, My images would be nothing.